In January 2016, just six months after its release, it was estimated that Windows 10 was active on 200 million devices. This means Microsoft’s latest operating system is currently growing faster than any version of Windows ever. It is at the forefront of Microsoft’s cross-platform vision aimed at improving usability and reliability. Windows 10 runs on PCs, mobiles, tablets, servers and games consoles. The growing popularity of Windows 10 means businesses need people with the skills to install, configure, manage and troubleshoot the new operating system. This gives you a huge opportunity to get ahead of the curve and learn Windows 10 skills before the majority of other IT professionals. 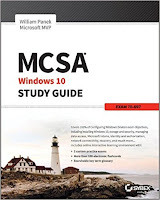 By passing the Windows 10 70-697 exam: Configuring Windows Devices, you'll achieve both the MCSA: Windows 10 and Specialist: Windows 10 certifications. These will prove to employers that you have advanced skills on the latest version of Windows. If you’re acting quickly to make the most of this opportunity, below are our five top tips to get you the necessary Windows 10 skills to pass your Windows 10 70-697 exam. Microsoft Virtual Academy has a huge amount and variety of resources aimed at helping you get the knowledge and skills to pass Microsoft exams and achieve Microsoft certifications. There are videos, articles and more to help you learn about Microsoft technologies. Plus many are aligned to Microsoft exams. The new release of Windows 10 means there aren’t a great amount of resources. However there are a couple of videos and presentations that are extremely useful for helping you study for the Windows 10 70-697 exam. The first, “Getting started with Windows 10 for IT professionals” has 9 different sections all dedicated to teach you more about Windows 10. Titles include, “What’s new in Windows 10 deployment”, “Runtime provisioning in Windows 10” and “Windows as a service: What does it mean for you business?”. There’s also “Accelerate deployment of Windows 10 at scale”. This includes an hour long video that covers some of the key topics in the 70-967 exam. The Microsoft Virtual Academy is ideal for giving you information that can help with your preliminary exam preparation. It’ll familiarise you with the new features of Windows 10 and how it differs from previous operating systems. Learning from a course is the best way to make sure you cover all the content you need to be prepared for the exam. Courses are dedicated to giving you all the skills and knowledge you need, not only to pass the exam, but to be able to use them in your workplace. Firebrand offers accelerated 6 day MCSA: Windows 10 and Specialist: Windows 10 courses that both prepare you to sit the 70-697 exam. Remember, you’ll achieve both certifications after you pass. As with all Firebrand courses, you’ll spend 6 days in an immersive classroom environment. You’ll learn from an official Microsoft instructor and bounce ideas off other students in the classroom. Practice tests are the best way to replicate the types of questions you’ll face in the real exam. They’ll also cover the full range of topics the exam could include. This’ll give you a better idea of what topics you’ll need to study. What is unique about practice tests is the immediate feedback they give you. This highlights any weaknesses you may have and gives you the chance to focus your studies in those areas. MeasureUp is the official provider of Microsoft practice exams. It is one of the most extensive resources for IT certification practice tests, offering packages for a large range of exams. You can find the Microsoft exam 70-697 practice exam here. This includes 119 questions to help you refine your knowledge on subjects like Windows desktop administration, maintenance and troubleshooting, Active Directory and Microsoft Intune. It then gives you thorough explanations about where you went wrong and how to improve. MeasureUp’s 70-697 exam practice test costs £79 to buy. Alternatively, 60 and 30 day online versions are available for £72 and £66. Firebrand also offer free and comprehensive practice tests for the 70-697 exam. You can access these on pages for MCSA: Windows 10 and Specialist: Windows 10. You can also find practice tests for all of Firebrand’s other 200+ accelerated courses. Getting a revision guide is crucial to studying successfully. They give you integral information about the exam topics. They’ll dissect complex technologies or theories giving you in-depth detail. Plus they’ll often indicate which sections require more focus than others. Here are our top recommendations for the 70-697 exam. Microsoft’s official revision guides are often a great place to start and are closely aligned to the exam content. 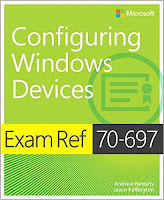 The revision guide for the 70-697 exam, “Exam Ref 70-697 Configuring Windows Devices” is no different. Written by Microsoft MVP, Andrew Bettany, it covers exam objectives including, plan desktop and device deployment, configure networking and storage and manage data access and protection. It also pushes you further with varied real-world scenarios that show you how your new knowledge can be used. You can find it on Amazon here. The ISBN is 978-1509303014. 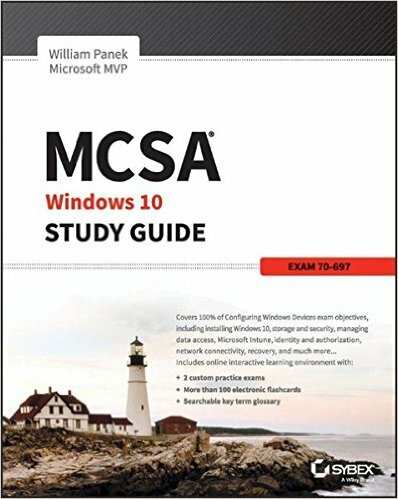 A reliable alternative to Microsoft’s study guide is the “MCSA Microsoft Windows 10 Study Guide: Exam 70-697” by William Panek. This is also closely aligned to the latest version of the exam to make sure the information you get is as useful as possible. As well as including plenty of content on all of the exam topics, it also gives you access to the Sybex interactive online learning environment. This gives you extra online content and flashcards to expand and vary your studies. This book covers the exam content in a slightly different way that may suit your leaning style, with the possibility to learn online at times when you may not have the book with you. You can find it on Amazon here. The ISBN is 978-1119252306. Downloading a trial version of Windows 10 Enterprise is the best way to practice and implement your Windows 10 knowledge. 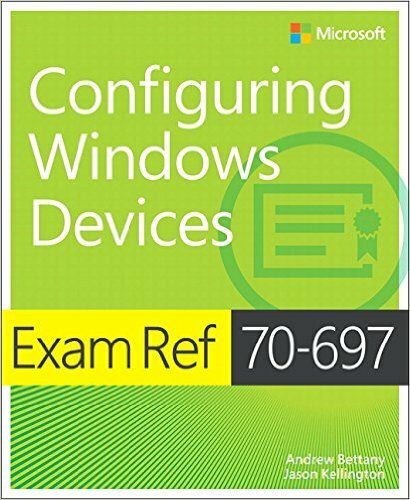 Combine this with a revision guide and you’ll be able to walkthrough each 70-697 exam topic, learning to manage each Windows 10 feature as you go. This’ll help make your learning more real, giving you an edge in the exam room.